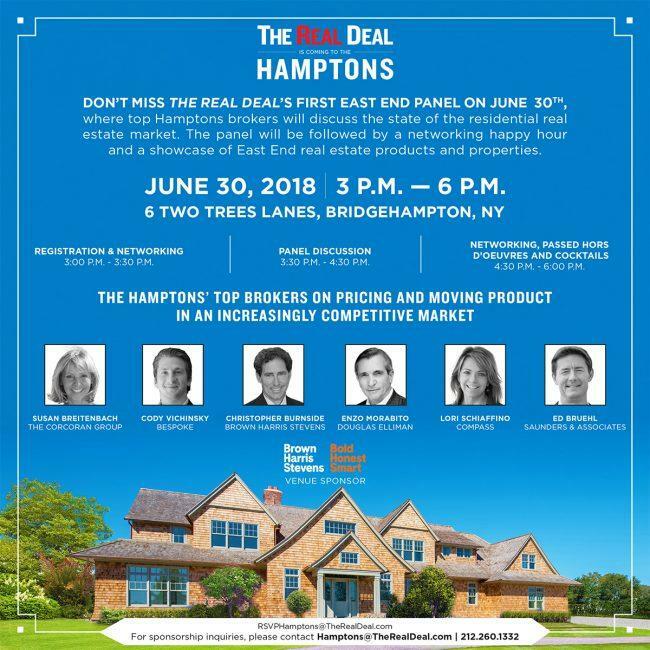 Don’t miss The Real Deal’s first East End panel event on June 30, where the top brokers in the Hamptons will discuss strategies for moving product in an increasingly competitive market. Confirmed panelists include Corcoran Group’s Susan Breitenbach, Brown Harris Stevens’ Christopher Burnside, Bespoke’s Cody Vichinsky, Douglas Elliman’s Enzo Morabito, Compass’ Lori Schiaffino and Saunders and Associates’ Ed Buehl . The panel discussion will kick off at 3:30 p.m. and will be followed by a networking happy hour alongside a showcase of East End real estate products and properties. We’ll be celebrating TRD’s fourth annual Hamptons Market Report, featuring a ranking of the area’s top brokers, an analysis of this year’s rental season, a look at the gatekeepers of East End development, and much, much more. For tickets, please register at RSVPHamptons@TheRealDeal.com. For sponsorship inquiries for this event or special issue, please contact Hamptons@TheRealDeal.com or 212.260.1332.